I, for one, don’t read romance, but Nora Roberts Trilogy Chronicles of The One is far from romance. Book 2 Of Blood and Bone is again set in the post apocalyptic world after the “Doom” has killed off most of the world’s population. We see the rise of elves, shifters, and Uncannys, any who has magical abilities. Along with the light(good) is the dark, those that want to kill, destroy anything they don’t understand. In Of Blood and Bone we watch Fallon come into her own through the training of Mallick, who has been waiting centuries for The One to be born. Fallon completes 3 quests that get her 3 spirit animals and when the time is right, and her powers within herself are realized, she will claim the sword and the shield. The readers are reconnected with characters from a Book 1 when Fallon travels back to New Hope to begin the training of her army to defeat the suffering and injustices that are being meted by those that follow the darkness. 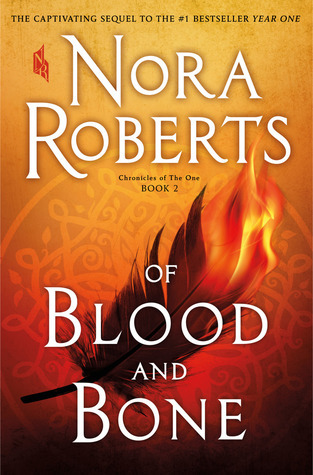 Light vs Dark, Good vs Evil, if you’ve never read a Nora Roberts book before, this series is a great read with adventure, magic, destruction and hope! The #1 New York Times bestselling author of the epic Year Onereturns with a new tale of terror and magic in a brand new world.